Abstract: Synchronization in networks of chaotic systems is an interesting phenomenon with potential applications to sensing, parameter estimation and communications. Synchronization of chaos, in addition to being influenced by the dynamical nature of the constituent network units, is critically dependent upon the maintenance of a proper coupling between the systems. In practical situations, however, synchronization in chaotic networks is negatively affected by perturbations in the coupling channels. Here, using a fiber-optic network of chaotic optoelectronic oscillators, we experimentally demonstrate an adaptive algorithm that maintains global network synchrony even when the coupling strengths are unknown and time-varying. Our adaptive algorithm operates by generating real-time estimates of the coupling perturbations which are subsequently used to suitably adjust internal node parameters in order to compensate for external disturbances. In our work, we also examine the influence of network configuration on synchronization. Through measurements of the convergence rate to synchronization in networks of optoelectronic systems, we show that having more network links does not necessarily imply faster or better synchronization as is generally thought. We find that the convergence rate is maximized for certain network configurations, called optimal networks, which are identified based on the eigenvalues of the coupling matrix. Further, based on an analysis of the eigenvectors of the coupling matrix, we introduce a classification system that categorizes networks according to their sensitivity to coupling perturbations as sensitive and nonsensitive configurations. 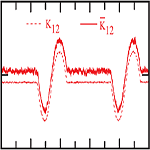 Though our experiments are performed on networks consisting of specific nonlinear optoelectronic oscillators, the theoretical basis of our studies is general and consequently many of our results are applicable to networks of arbitrary dynamical oscillators.